The Left is getting massively out-Alinskyed, and the hilarious thing is that this band of withered hippies, unemployable millennial safe-space cases, and unlovable + unshaven libfeminists don’t even know it. Oh, their masters sure know it. Soros is bitterly having to ramp up his infusions of blood money to keep his community-organized “grassroots” movements afloat. The less dumb ones among the lying dinosaur media are panicking as their influence fades, and Chuck Schumer is enduring such a non-stop parade of serial humiliations that if the Senate were a penitentiary, he’d be McConnell’s prison Mitch. The Leftist mafia godmaleidentifyingparents pulling the strings of the Marxist Muppets know the score – they are losing. And it’s awesome. Because, finally, the Right has taken Saul Alinsky’s Rules for Radicals and shoved it up where #TheResistance don’t shine. Thank you, Andrew Breitbart. You yelled “Follow me!” and led a movement that had previously been dominated by doofy wonks and bow-tied geeks over the top in a glorious bayonet charge against the paper tiger liberal elite. The Left hadn’t taken a good, solid gut punch since Ronald Reagan turned the Oval Office keys over to the wimpcons who found fighting Democrats uncouth because conflict made for awkward luncheons down at the club. Bizarrely, the guy who picked up the standard and carried it forward when our beloved commander was felled by fate was a New York billionaire with no identifiable ideological foundation who instinctively understood the one thing that could make up for his other failings: He knows how to fight liberals and win. For Donald Trump and the revitalized conservative movement, Alinsky's book isn’t some dusty old commie tome - it’s a lifestyle. Alinsky’s Rules are relatively simple, and they make sense when you are fighting a conventional opponent with an interest in maintaining the status quo. The Rules are terrific for dealing with an old-school conservative guy who drives a Buick, enjoys gardening, and doesn’t want any trouble. They aren’t so effective against conservative brawlers who like to punch, and who aren’t too fussy about whether it’s with tweets or with fists. The Rules are not some magic incantation; they are simply some tactical principles that work in certain kinds of fights against certain kinds of opponents – particularly ones willing to unilaterally disarm in the face of an unprincipled enemy. But once the secret is out, it’s relatively easy to turn them around on an enemy that is so stupid it thinks it’s going to gain widespread acceptance among normal Americans by dressing up as genitalia. That’s why the thirteen classic Alinsky Rules are playing out right now in a way the Left did not expect. Rule 1: “Power is not only what you have, but what the enemy thinks you have.” Actually, we now have a lot of power. No, we don’t have direct power over liberal bastions like Hollywood, the media and academia, but by threatening to use governmental levers of power to impact their tax breaks, copyright laws, and subsidies, we can pound them into submission. And Trump is clearly willing to use all his powers to beat the living liberalism out of our enemy. Wake up. Man up. If you ever want to win (and maybe someday even kiss a girl) you need to get real. They hate us, and we either win or we spend the rest of our miserable lives as Boxer the Horse, slaving away to fund the welfare state under the lash of the Left until it decides it’s time to pack us off to the glue factory. Rule 2: “Never go outside the expertise of your people” and Rule 3: “Whenever possible, go outside the expertise of the enemy.” Stupid GOP wonkcons want to fight to where the liberals are strong, like on entitlements. Trump is smart enough to fight where liberals are weak, like on the economy. And he’s going to throw down some serious jujitsu by doing a liberal thing – infrastructure spending – in a conservative way. He's a developer – he knows how to build stuff, and he will freak the Left out by delivering concrete results (not the least of them, a wall) where liberals (for whom “infrastructure” means giving our money to their deadbeat constituents) never actually build stuff anymore. As a conservative, I’m not thrilled about “infrastructure” spending. But as a conservative insurgent who wants to see the Left on its collective collectivist back, twitching like a dying roach, I’m thrilled. Rule 4: “Make the enemy live up to its own book of rules.” This is not so much about pointing out the lies and hypocrisy that constitute Leftist orthodoxy – the vicious racism they deny is racism because it’s anti-white, the racism against non-whites who refuse to serve a liberal master, the sexism against women who think babies should be actually be born, and so on. It’s about not letting them tie us into knots by using our morals and values as bear traps to immobilize and neutralize us. Fortunately, most of us have discovered how losing our superficial “political values” helps us regain our freedom. We have embraced the power of not #caring. And liberals have no idea what to do when they shout “Trump is a meanie,” and we shrug, smile, and bust out with an impromptu interpretive dance to celebrate Neil Gorsuch. Rule 6: “A good tactic is one your people enjoy.” I’m having fun watching the liberals lose. How about you? Rule 7: “A tactic that drags on too long becomes a drag.” I don’t know – I doubt I am ever going to be tired of so much #winning. Rule 8: “Keep the pressure on. Never let up.” Remember the Trump outrage du jour a couple days ago when we were supposed to be on the verge of war with Australia? Well, Down Under’s kangaroos and giant scary spiders still wander freely, and we’ve long since moved on. President Trump has been busy owning the news cycle with appointments, executive orders, and the occasional squirrel-sighting tweet that sends the media chasing off on a rodent-seeking tangent. Oh no, Kellyanne Conway said to buy Ivanka’s stuff – if I ever cared (and I never did), I’ve already moved on to giggling about the progressive freak out over ICE being allowed to do its job again. Rule 9: “The threat is usually more terrifying than the thing itself.” No, Alinsky was wrong. The thing itself is much, much worse – as Democrats will find out when President Trump signs the law mandating national concealed carry reciprocity. Rule 10: “The major premise for tactics is the development of operations that will maintain a constant pressure upon the opposition.” Democrats are trying to do the massive resistance thing again, and it’s going about as well as when they tried the massive resistance thing against integration. 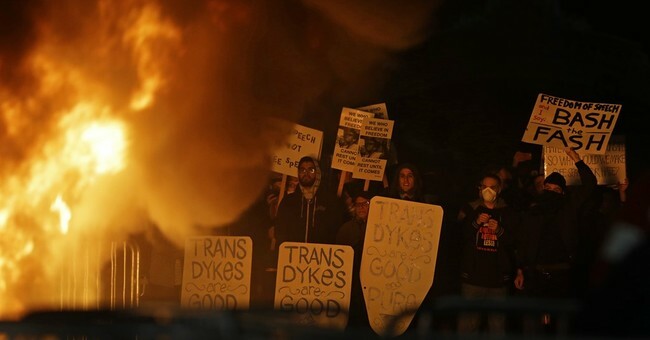 It may arouse libs in blue cities and on soon-to-be-defunded college campuses, but normals are getting tired of the nonstop Leftist nonsense. See Rule 7. Conversely, Trump’s nonstop series of orders, appointments, and policies seems to be helping him – mostly because they are popular. The Democrats have no meaningful policies because their entire focus is on them regaining and keeping power – that’s their desired end state, not a country made great again, and that’s why they get no traction anywhere on the map outside of the dysfunctional blue spots. Watch for then to eventually seriously propose secession by the liberal states – after the last few months, I’ve been tempted to move my novel People’s Republic, about California ignoring the admonition to never go full Venezuela, over to the nonfiction section. Rule 13: “Pick the target, freeze it, personalize it, and polarize it.” Well, they try to. They try to make Trump a demonic chimera composed of bits and pieces of Hitler, Mussolini, and more Hitler, and he just doesn’t care. We don’t care, because we know what they are really saying is that we normals are the monsters, that it’s not Trump governing that is illegitimate but that it is we normals having a voice in governing ourselves that is illegitimate. And now we are woke, as the ridiculous Left would put it, to the Left’s tired Alinsky antics. We see it’s all a lie. It’s all a scam. And we aren’t playing the game by their rules anymore.